Salt Chamber is “Leading the World in Salt Therapy Solutions”™. 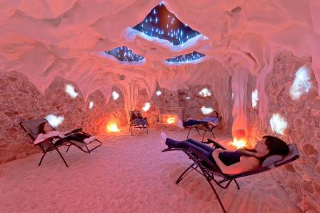 Salt Chamber has been working with spas, resorts, wellness centers, and facilities all around the world providing the best in designing, building, training and marketing salt therapy, salt rooms, salt caves, and Himalayan salt décor. Salt Therapy, also known as halotherapy, is an established modality throughout Europe and has been growing here and abroad as a unique, distinct and innovative add-on service for spas as well as an excellent opportunity as a stand alone business. Salt Chamber works with spa consultants, architects, spa and business owners in discovering how salt therapy can be a profitable and successful revenue center that produces therapeutic and aesthetic value for all types of consumers. Everything from “Do-it Yourself” to complete Turnkey Operations (No franchise or license fees).